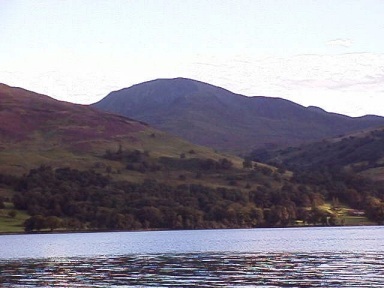 Ben Vorlich and her neighbour Stuc a 'Chroin stand on the southern edge of the Highlands and the easiest way to access them is from the southern shore of Loch Earn. 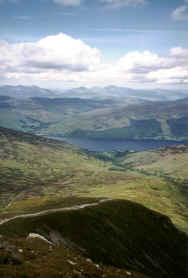 The pair provide an excellent day out, with fine views to the Ben Lawers range to the north. Ben Vorlich is a straight-forward ascent while the climb from the bealach between the two Munros on to Stuc a' Chroin offers some easy scrambling up a steep, stone-strewn buttress (this can, however, be avoided). There's plenty of roadside parking at Ardvorlich, the starting point for this route. Head east along the lochside road from the layby, crossing over a stone bridge. Turn right once across and go through a set of stone gateposts. A track runs south from here towards a steading. A sign just before the buildings are reached points hillwalkers right, back over the burn. Turn turn left a few yards on, before entering the gardens of Ardvorlich House, and the track rises quite steeply, running parallel to the burn, to reach a kissing gate. Go through and continue up the track to a wooden gate and stile. Beyond this, the way curves right and then left, rising quite strenuously over open hillside carpeted with bracken. Higher up, another gate with a stile is passed before the track enters a patch of woodland and fords a small burn. Carry on up the track and it crosses the burn by way of a rather wobbly wooden bridge. The track ends here and a path strikes off over the open hillside. In years past this was a rather boggy affair, but at the time of writing work is underway to reconstruct it. The route rises up the right hand side of the southern shoulder of Ben Vorlich, skirting above Coire Buidhe to the west. In due course, the path bears left, climbing more steeply on to the ridge. A cairn marks your arrival on the broad shoulder. Continue south, up the ridge, the grassy slope giving way to a harsher landscape of bare rock and scree. A couple of zig-zags assist in the sweat-inducing job of gaining height and a final pull brings you out at a trig point at the north-west end of the level summit ridge. Around 100 yards along this is a large cairn and stone windbreak. To continue on to Stuc a' Chroin, descend over the south west shoulder of Ben Vorlich, a well-walked path following a line of fence posts down into the Bealach an Dubh Choirein. From the bottom, the first section of ascent climbs over a slope scattering with boulders, leading to the foot of a prominent buttress. If you're a scrambler, the crest offers a fair challenge with a couple of hard moves. Walkers, however, should head right on the path which rises steeply over stones and scree, negotiating some hefty boulders to reach a cairn at the top of the buttress. The summit is about 500 yards to the south of this. To return home, descend back to the Bealach an Dubh Choirein, then drop left (north), skirting right, round the west slope of Ben Vorlich to reach the col between Ben Vorlich's north west shoulder and Ben Our. Descend north east into Coire Buidhe to rejoin the Glen Vorlich track near the wobbly bridge. Maps OS Landranger sheets 51 and 57. Start/parking Ardvorlich on the south Loch Earn road. GR: 633233. Grading A straightforward ascent of two Munros, with the option of some scrambling on Stuc a'Chroin. Sheep grazing, so dogs on lead.